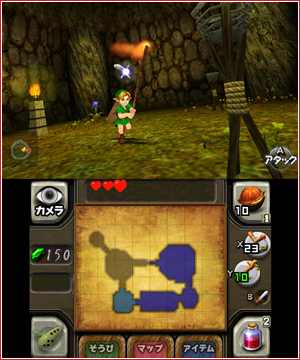 So with all the excitement surrounding the 3DS information that was released at the Nintendo held press conference in Japan (and I am sure our day will be littered with updates about some of the most highly anticipated 3DS titles) I thought it would be a great to show off some of the latest screen shots from Ocarina of Time 3DS, which further show off the graphical improvements to the game. 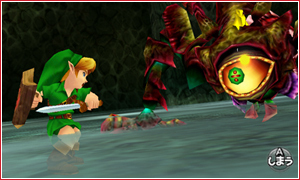 The above two screenshots show an amazing difference in the look of Link, particularly the face. Another thing to note is how crisp and HD like things look, which is a major plus. We have two more screenshots after the jump, and part of the control scheme is revealed inside. 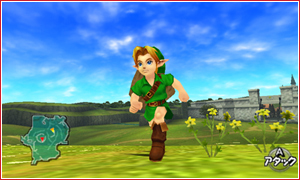 As you can see to the left, here we have what the bottom screen of Ocarina of Time 3DS looks like, and as can be expected, it’s the inventory screen. While not a lot has changed to it, it has gained some additional functionality. For starters, the “eye” in the upper left hand corner takes you to the camera controls, which one assumes is the ability for the free roam camera we had in the original title. The left tab on the bottom is for for equiping items, the center one is for the map, and the one on the right is for other items (collectibles, etc). It naturally changes what appears in the center of the inventory. In addition to tapping those buttons, you can use the traditional L and R buttons to also navigate between them. As for actual controls, the A button is your attack button, and when standing still long enough it is also your sheath button as well. In terms of movement, we honestly do not know, but it is assumed that the thumbstick would server that purpose just like in the original. Overall, the new inventory and controls are solid, and I am glad they didn’t try to over complicate things such as using the stylus to move the character ala Phantom Hourglass and Spirit Tracks. 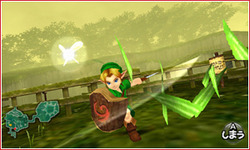 To the right is Link simply mowing the lawn Zelda style. These screenshots are showing a lot of promise with the visuals, and the inventory screen is showing a nice use of touch controls to make things simpler. Overall I am impressed with what we know so far. Fair thee well Zelda Informer, bringing you diminished Zelda news since circa September 20th, 2010.